Letters or initials are a great accessory to any room. Do you have any that appear throughout your house? I have a lot a few and love them all. Each letter of the alphabet already has its own personality with its curves, lines or empty space, but adding texture, paint or fabric to letters adds so much more to the accessory. I thought I’d share some of my favorite letter purchases with you. CraftCuts.com has an amazing selection of different sizes, material and fonts…talk about being able to customize! The Aidan Gray Decor Framed Typeset available at Layla Grace is another fav…I love that you can do almost anything with these letters. They are sophisticated enough for a dining room and yet would look great in a nursery as well. And I kind of think I have the perfect wall in my kitchen to spell ‘Eat.’ The possibilities with this size letter are endless. Now, I can’t deny that I love Urban Outfitters for so many reason, but did you know they have three initial options? I have to say the acid etched one is my favorite, but how cute would the map ones be in an ‘Around the World’ room? This 23.5″ letter is only $9.99 and you know you can always find a coupon for Jo-Anns! I recently purchased this paper mache letter from there for $4 and added some texture of my own to it. 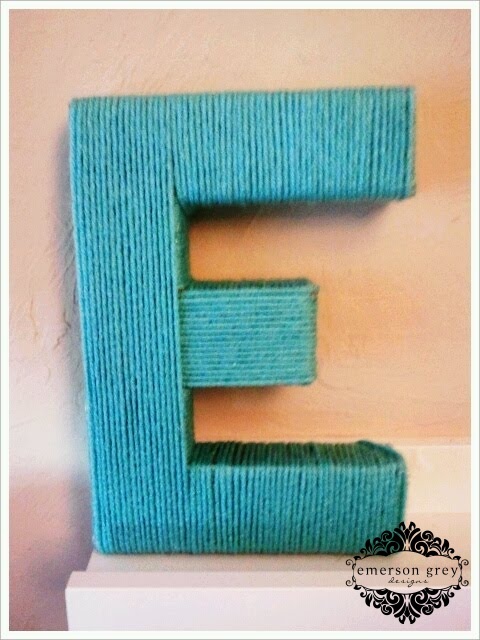 Using basic yarn in a color of your choice wrap it every which way and voila…fun letter! That’s also another little peak into the kids room that isn’t completed yet. So…I’m interested to hear…do you have initials anywhere in your home?